Both patients and team members enjoy the remarkable transformations we've been doing with Invisalign since 2006! Invisalign® uses a series of clear plastic trays (called Aligners) to slowly move your teeth to the desired position. The process is a fascinating use of both 3D imaging and virtual reality. First, we make models of your teeth and send them to the Invisalign lab. They use a combination of digital expertise, dental knowledge, and the physics of tooth movement to determine where the ideal position of your teeth should be at the end of treatment. Then their computer technology determines how much to move each tooth with each successive tray to get your teeth to the end result. With every passing year, more and more of our patients ask about Invisalign® and many are now raving fans after their treatment. In fact, we have now treated half of our staff! Can Invisalign® fix every smile? It is not the right treatment for everyone. If you have a severe bite problem or jaw joint popping or pain, you would want a consult with us, that said, if you are a candidate for Invisalign® you will love it! For years, Dr. Lynda did regular braces right here in our office, so she can give you the best advice on if Invisalign® is right for you. You may have many other options! Dr. Lynda has 25 years of personal expertise in the art and science of "Cosmetic Dentistry", so she may have suggestions for you that are even better than Invisalign®, for your particular situation! Click over to Dr. Lynda's "Smile Gallery" to find countless options, and before/after photos of our patients' smile make-overs. Bottom-line: Every situation is different, so the best thing to do is come in for a consult to learn about your particular needs. You'll wear each set of Aligners for about two weeks. Removing them only to eat, drink, brush and floss. Your teeth will move gradually each week and you will visit us about every 6 weeks. Total treatment time averages 8-18 months. The photo at the right is very typical of some of the cases we love to do. This gentleman is over 50 and you can see his teeth had shifted and his smile looked very unusual, with the one long front tooth and the gaps growing between the lower teeth. This fellow is a business man and he loved the fact that the Invisalign® trays were invisible. After 14 months, it looked like we had turned back the clock 25 years! 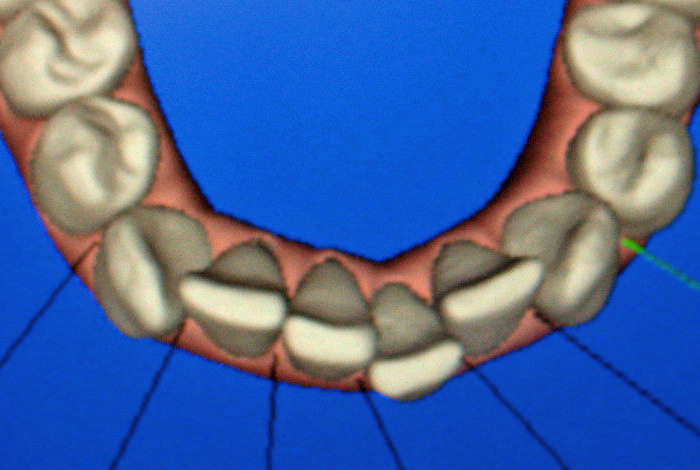 Invisalign® is best used to correct front teeth that have excess spaces, or look crooked. It is a wonderful second treatment for people who didn't wear their retainers after they had their braces done as a teenager. Invisalign® is used for teens over age 14 and adults of any age. And the following case is a patient who didn't wear her retainers after braces, and you can see her lower teeth had moved back to their original position and were very crowded. So now at age 33, she wanted her best smile back!.. Invisalign® uses a series of very thin clear plastic trays to move your teeth incrementally to the desired position. We give you a new set of clear trays every 2 weeks. These nearly invisible trays must be worn 22 hours a day, and should only be removed at meals and for brushing and flossing. Most treatment times are between 8 to 15 months. Initially, we complete a comprehensive exam of the health of your teeth and gums. You would not want to begin Invisalign® if you have active gum disease, or active tooth decay. If your teeth are in stable condition, we will evaluate your "bite" and decide whether INVISALIGN® can address your chief complaint. After determining our goals, we take the photos, models and X-rays that are necessary to fabricate the series of plastic trays. About a month from your initial visit, you begin your treatment by receiving the first 2 trays, After that, you will visit us about every 4 to 8 weeks for a check of your progress and to receive the next trays in the series. It is critical to understand that this methodology only works if you are absolutely committed to wearing the trays 22 hours each and every day of your treatment time. Less than this can add months of time to the end of your case. When the final tray has brought the teeth to the desired position, we have you come in and we take an impression for a retainer that you wear at night . Consumer Tip #1 : Ask to see before/after photos of the dental office's own Invisalign® patients. Every dentist that is serious about cosmetic dentistry - and the beautiful outcomes possible - will be able to instantly show you professionally inspiring before/after photos and be proud to do so. If they can't put their hands on photos that inspire you, I might recommend getting a second opinion. Consumer Tip #2 : Dr. Lynda took years of extra study to become good at treating people with braces right in our office. It's important to work with an Invisalign® dentist who has had a background in orthodontics if possible. They will steer you in the right direction to make sure your time and money is spent well. To find out if Invisalign® is the right option for your smile,give us a call to come in for a visit!